Classic kitchen transforms a 1935 Spanish house "AFTER"
The owners of a picturesque 1935 Spanish home had updated every room, except the kitchen. They wanted to address some functional issues and make a classic design statement. The layout worked well, except for the wall oven grouping on the west wall. The new concept has a countertop on base cabinets and new wall cabinets. A microwave drawer is built in on the left, keeping the countertop clear. Behind the right door is an adjustable-arm shelf for the stand mixer, to lift and use. A 48” wide range with 2 ovens provides all the cooking and baking needs in one place. To make this wall a focal point, the beveled Carrera marble tile flows to the ceiling with a framed accent of Carrera marble in arabesque tile. The center of the hood is painted matt black to complete the design statement. We raised the ceiling to 10 feet, allowing a second row of wall cabinets and a recessed cabinet above the side-by-side refrigerator. This addressed the additional storage needed. The sink wall has a double bowl sink and new faucet. The contrasting black quartz countertop will be easy to maintain. 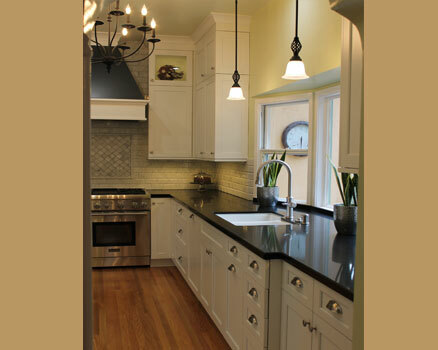 The white Shaker style cabinets provide classic details and ample storage, including a lazy susan in the corner. For continuity, a matching panel is on the dishwasher. Wrought iron accents in the HVAC grill, chandelier and pendant lights are a nod to the home’s Spanish architecture. The tile floor was replaced with the oak flooring that runs throughout the house. The light green walls in the kitchen are carried into the breakfast room for a cheery backdrop. New drapes complete the transformation in this room. The functional space and timeless design will be a joy for this family for many years to come.